Morning departure from LIsbon, drive north and arrive in Óbidos, the beautiful walled town. Visit its picturesque streets and the Pousada do Castelo. After drive to Alcobaça to visit the 12 th century Church with the tombs of D. Pedro and Inês de Castro Stop for lunch in Nazaré, a colourful Portuguese fishing village. If possible go to Sitio for a panoramic view of the beach and the village. In the afternoon visit the Batalha Monastery, a Gothic masterpiece ,considered a World Heritage by UNESCO. Arrival at Hotel in Fátima. Evening free (to eventually assist mass service). Overnight at hotel in Fátima. After breakfast at hotel, free day for different activities in Fátima. 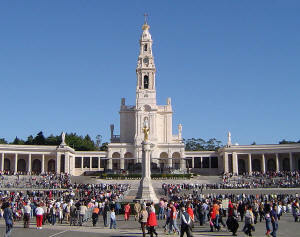 Fatima is the center of Christian Faith and a local of World Pilgrimage. Visit the church where the tombstones of Lucia, Jacinta and Francisco are, as well as the Chapel of Apparitions, heart of the Shrine. You will have time to assist a mass. At the end of the day we will return to Lisbon through the colorful farming region. End of services. Tour departs at 9 am from Marques de Pombal square in Lisbon or free pick up from Lisbon hotels.